Inserted in the Peneda-Geres Park, in a quiet area and surrounded by mountains, Nobrega Da House offers to all its visitors its due rest surrounded by beautiful nature. Whether you want a 'getaway' romantic or a family holiday, our house has all the amenities necessary for a dream vacation. This cozy and renovated house is located in the village of Aboim da Nóbrega, a mere 13 km from Vila Verde, 13 km from Ponte da Barca and 24 km from the center of Braga. It is located in a hilly quiet place with breathtaking scenery where pleasant walks can always be made in the presence of numerous animals that share with us this little paradise. General Information: Bed and bath linens are included. Heating in the rooms and toilets. Firewood for use of the fireplace. WiFi internet (free) available throughout the house. The village of Casais de Vide is a privileged destination for all those who seek to relax in contact with nature or simply to rest and breathe fresh air, followers of terrestrial, equestrian or btt trails, photography lovers or for all those who wish to know our culture, heritage and traditions or enjoy the good local gastronomy. The surrounding region has a huge diversity of landscapes that make up authentic idyllic settings. Head to the discovery of unique moments with nature and explore the most recondite places, treading the paths loaded ancestral experiences of the people of these lands. Discover these footprints time on foot, horseback or bicycle through the many paths that pass Couples Vide. A cottage in the clouds. This little cottage is exquisitely furnished and comfortable. A recent remodel has resulted in a modern and updated feel in a little rock cottage. Both interior and exterior walls are rock, while the kitchen includes upgrades like an induction cooktop. The bathroom shower is very well done with a clear glass enclosure, good water pressure and water runs as hot as you like. The wooden shutters on all the windows and on the door allow for complete darkness in the rooms (easy to catch up on sleep when you are still getting over the time change). The area is very rural, with cows, sheep and pigs in the area, and farmers moving them from fields to the barns in the morning and evening. Listening to the cows' bells and the gentle "baas" from the sheep are a small part of the bucolic atmosphere surrounding this wonderful little place. Felipe and Sandy are welcoming hosts and very attentive to any needs. We will recall our stay here with fondness, and will to return to this little Cottage in the Clouds. Thank you Stephan and Barbara! It was such a pleasure for us to have you two as guests and so glad you loved it. You were our first guests after the recent remodel and we were afraid that we could forgot something but everything just turned out ok.
A very lovely, authentic rural Portugal experience. Hosts were great, scenery and hiking nearby was excellent.Peaceful surroundings, with daily delivery of bread and fish, stone granaries, farm animals and far off church bells. 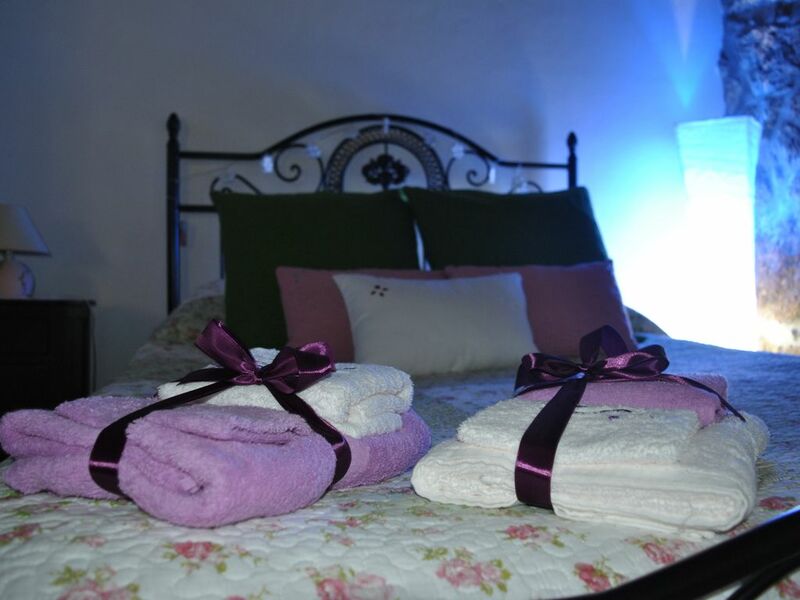 Cottage was cozy and sufficiently equipped for comfort and self catering. Unfortunately rural Portugal sometimes means barking dogs and we did experience this during our eight nights. Thanks to our hosts, Felipe and Sandra for this great experience. Leuk authentiek onderkomen in een prachtige omgeving! Ruime woning, modern sanitair en keuken. Wat ik miste was een waterkoker, voorraadje handdoeken, een schaar, een vliegengordijn bij de voordeur en een hangkast. Aardige eigenaren die van alles over de omgeving vertelden. Een aanrader. We are glad that you enjoyed the stay in our house and we wish you the best for the rest of your holidays. It was a pleasure to meet you and we hope to see you again sometime. Muy lindo lugar para desconectar. Buen contacto con una familia muy amable. Thx Robbert. We only hope you enjoyed your stay as much as we did. You and your family are the kind of guests that come as visitors but leave as friends... Hope to see you in one other time. Wir haben zu dritt eine Woche in dem urigen Steinhaus von Filipe und Sandra verbracht und uns sehr wohlgefühlt. Es liegt in herrlicher Umgebung in einem kleinen Dorf, in dem Kühe, Ziegen und Schafe frei herumlaufen. Man kann über die grünen Hügel wandern und die Seele baumeln lassen. Die Innenausstattung ist nicht perfekt, aber die Räume sind liebevoll gestaltet, vor allem das Schlafzimmer. Wer Atmosphäre, Ruhe und Gastfreundschaft schätzt, ist hier genau richtig. Thank you Hilke, Christoph and Emma... We are very pleased that you enjoyed our house and our company. We had also a very pleasant time with you and you are the best visitors a host can wish. We hope that we will meet again one day. All the best whishes for you all.